Zero Characters Left: It's here! It's here! The PCB that I designed has arrived! Actually, it has been for a while now, I just have not had the time to write about it. It's an amazing feeling to open a package from the other side of the world to uncover something that you created yourself out of bit and bytes. Overall I'm quite happy with the results. I received 11 copies of the board, five of which have been electrically tested and are clearly marked. 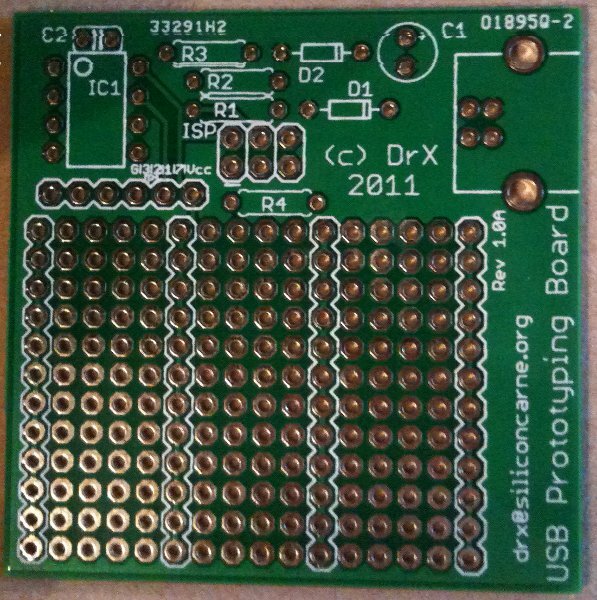 One of the boards has some visible imperfections, which most likely explains why I got 11 instead of 10. For a small fee you can get them to test all the boards, but I don't plan on actually building more than a handful of these. I messed up the silkscreen a bit in the area around the break-out connector and the pin labels are not extremely clear. I really need to be more careful with the placement of component labels. The PCB fab was so kind to add two sets of production codes to my design. I don't particularly like it, but I don't mind a lot either. I'll let you know how things pan out when I populate and test it.